uniFLOW is a Canon-based output management software that provides effective controls over a client’s printer and multifunction printer (MFP) fleet. This award not only spotlights a significant achievement for the Datamax sales team, but solidifies the organization’s holistic approach to understand, identify and deliver relevant solutions to its clients - not just boxes. uniFLOW allows users to better manage printing costs, increase office work productivity, and protect provide optimal document security throughout the organization. 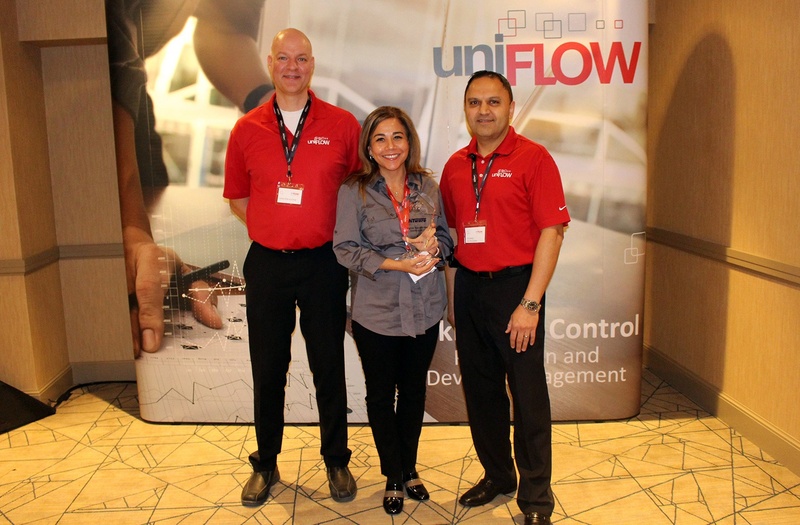 Datamax’s achievement in delivering uniFLOW to clients in both Texas and Arkansas was a team achievement that spanned multiple departments beyond sales. Datamax this year celebrated 35 years of partnership with Canon, an entity that company stakeholders site as a major contributor to Datamax’s sustained success. In addition to being named to the Canon Advanced Partner Program for a fifth straight year, Datamax is also a Canon ATSP Service Provider (11 years in a row), putting it in elite company among Canon Authorized Dealerships. Datamax Inc. offers the latest equipment and solutions in technology to increase efficiency and productivity in customers’ offices. Datamax Inc. has been in business for over sixty (60) years with offices in Arkansas and Texas with more than two-hundred (250) employees in two (2) states.